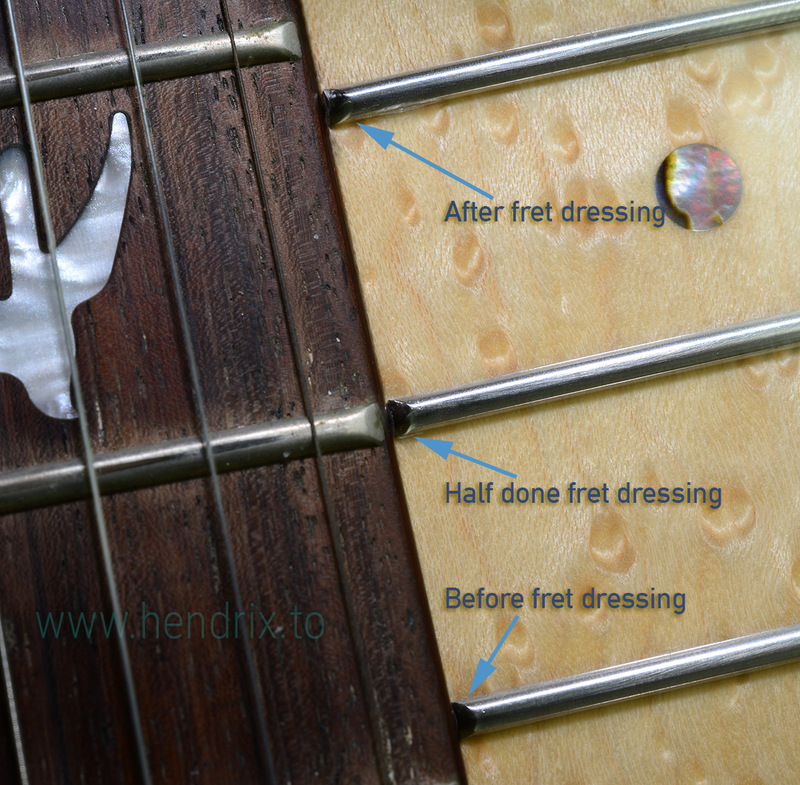 Warmoth's update fret work info and Power tools Fret dressing Tutorial - 吹水 bar - 飛羽大同 allbird.org - Powered by Discuz! When I finish my Power tools Fret dressing Tutorial video and check info on Warmoth's website, find that they have update fretwork info, maybe after some post talk about they change the back-bevels the fret edges to about 30° recently. 2.5 : Removed finished on fret if it is Maple fretboard. Please watch it on YouTube full screen, as it got some details close up footage. Also thanks Cagey talk about heating up issues may happen when using Power tools on the fretboard, I put some warning and matter needs attention in the video. 1 : with this closeup photo, compared to a factory made guitar ( PRS SE ) I sure not remove too much. 2 : did you watch to the end of the video? I talked about Warmoth increasing the back-bevels the fret edges to about 30° recently. that leaves not much room for you to do If people need to round fret end dressing, if you want to do what I show in the video, need to ask Warmoth don’t bevel it and not buy showcases neck with frets installed already. 3 : I will be made a follow-up a video on what I have done for the 30° back-bevels the fret edges when I have time, it removes much less on frets end. 4 : what I trying to illustrate there was a technique I believe useful for other DIYer, how much to remove is a personal preference with his playing style. Processed in 0.010268 second(s), 8 queries.